Anadigm has released for sale two new Development boards. Supporting two and four AN231E04 FPAA's respectively, the board have new faster USB connection to a PC and support larger Analog circuit design through multiple FPAA IC's. 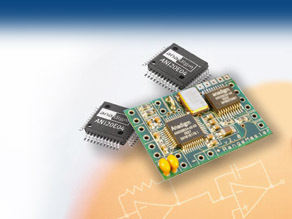 These boards contain a 3rd party 80MHz, 32Bit controller suitable for use developing embedded FPAA algorithms directly from exported AnadigmDesigner2 c-code. New - Application Notes Library, Example Projects and Demo's (software code and harware description) now being published here, check back regularly to see the new documents, circuits and code.